SONOMA 2pk. 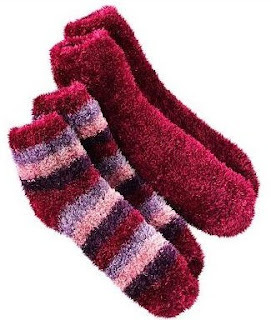 Feather Chenille Striped Slipper Socks only $2.96 Shipped! Reg $14! Head over to Kohls to get a great deal on a 2pk of SONOMA feather chenille striped slipper socks! They regularly cost $14, but you can use 2 promo codes! Add some socks to your bag. When you checkout, use the code SECRETSANTA to take 20% off and then use XMASFREE to score FREE shipping. Your final price will be $2.96! (You have to enter your CC information before you can apply the codes) NOTE: There are different colors to choose from. Just scroll down the page a big and on the right sidebar, you'll see "similar items". *If you have trouble entering the promo codes, try switching browsers or restarting your computer! 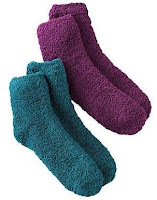 You can also get this 2pk of SONOMA Cozy Solid Slipper Socks for the same price! NOTE: While you're there, check out their Clearance section for more awesome sales!